As Pokémon Go is taking over the planet, some people have discovered that their cheap smartphones are lacking a gyroscope–although smartphones that have at least 2 GB of RAM and Android 4.4 or newer (Pokémon Go’s requirements) should normally include a gyroscope, but Huawei P9 lite doesn’t. And I discovered it wasn’t that clear to me which sensor does what in a smartphone. First of all, I was puzzled that a gyroscope was even needed. For what it’s worth, all the phones equipped with an accelerometer–which means all the smartphones–can sense their position, they know when you rotate them and which side is up, etc. What’s the deal? An accelerometer should in theory measure non-gravitational acceleration, that is motion that isn’t constant in speed and direction, and a typical 2-axis accelerometer would measure linear acceleration based on vibration that induces through physical pressure an electrical charge in microscopic crystals. Similar–but much less sensitive–crystals are used in piezoelectric cartridges for turntables, in electronic kitchen scales, and in those blood pressure monitors for personal use, so this technology is dirt cheap. Technically, a 2-axis accelerometer cannot be used to determine the exact orientation of an object. In practice, smartphones have 3-axis accelerometers that however include the gravitational acceleration in their readings, yet despite their lack of precision, they can determine the orientation of an object relative to Earth’s surface, but when the object starts moving, the readings become more difficult to interpret. Distinguishing between an object that accelerates on its own will on a direction and an object that falls because of the gravity is tough business, although software algorithms can surely understand that values close to 9.8 m/s2 on any given direction can only mean one thing. A gyroscope, using the principles of angular momentum, can determine the exact orientation of an object relative to Earth’s surface–its angular position–and the exact direction of what’s called “down.” As the object rotates, it can sense the tilting or rotation as non-zero readings. Smartphones don’t include the classical types of rotary gyroscopes based on permanently-spinning rotors, but rather “vibrating structure gyroscope” devices that use the Coriolis force to determine the orientation of a tiny resonating mass. Such sensors can use crystal or ceramic piezoelectric transducers–hello, accelerometers!–or silicon transducers. This field is full of innovative ideas, as one can see from articles such as this one or this one, but I’m sure the devices used in smartphones must be cheap before anything else. With an accelerometer you can either get a really “noisy” info output that is responsive, or you can get a “clean” output that’s sluggish. But when you combine the 3-axis accelerometer with a 3-axis gyro, you get an output that is both clean and responsive in the same time. Three physical sensors–implemented in one or two chips–are enough to create all but the last of these virtual sensors through software. 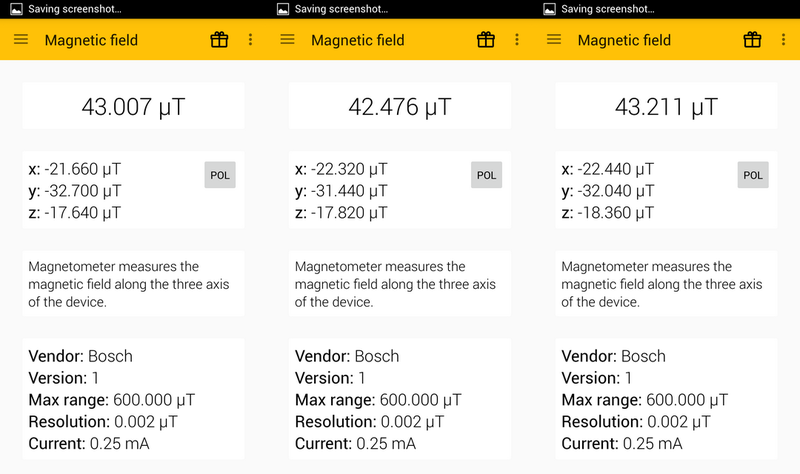 By the way, Sensor Kinetics is another useful app, should you want to know how your physical (“Three Dimensional Sensors”) and virtual (“Derived 3D Sensors”) are implemented. 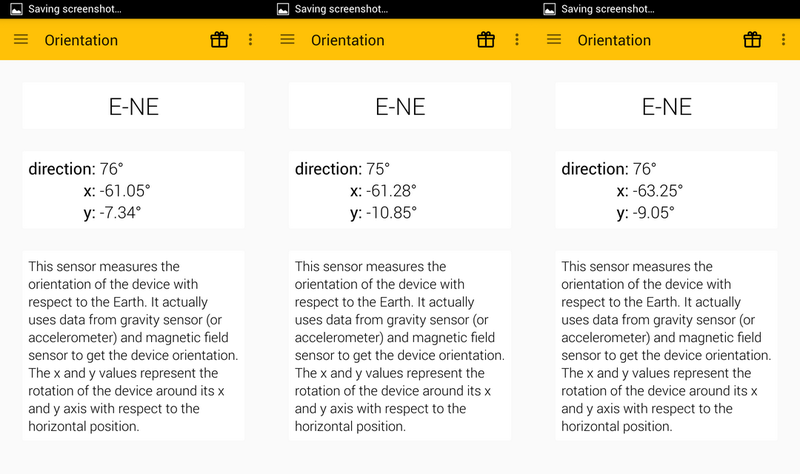 It lists “Gravity Sensor” (TYPE_GRAVITY), “Linear Acceleration” (TYPE_LINEAR_ACCELERATION) and “Rotation Sensor” (TYPE_ROTATION_VECTOR) as derived 3D-sensors. How do I “Upvote” this comment?